Words cannot describe what I’m feeling right now Woah…that was just- Okay I’m going to try something different just this once. I’m going to break this review up into sections so I don’t miss anything and to make sure that I can actually think straight. Before I say my embarrassing moment, I’ll start with Tuesday night-the night before I finished this masterpiece. I barely read CP as I was so busy with school starting again from summer holidays. Last night I went from 100 pages to page 400 and I was so desperate to finish it I took it with me to school the next day. We had ‘Mentor Group’ so I began to read in the cacophony of loud voices. I really should have stopped, but, like all book worms do, I kept reading. Because of Clare’s heartbreaking ending, I became a little teary. Oh yeah Mel, so what? Thanks to my lovely friend who was sitting next to me, she practically shouted “ARE YOU ALRIGHT MEL! ?” Gawd, it was embarrassing, 25 pairs of eyes just staring at my red wet eyes. So why didn’t I put this under the ‘I cried’ shelf? Simply because when I say I cried, I mean literally thrashing and sobbing like a six year old. Tessa becomes more and more real, more and more developed and more and more amazing. She is really strong, helpful and understanding which I adored and became attached to. Additionally, she develops more with her ‘warlock-ness’ and humane. I never have found such an all round beautiful character. Cassie Clare never disappoints when it comes to a complex, twisted, freakishly unexpected plots. I really think it is something hard to find as now, all I’m discovering are boring, obvious plots that the main character is stupid enough to not decipher. After Charlotte has been questioned upon the Clave, Tessa, Will, Jem and the rest of them are given 2 weeks to find Mortmain, or their home will be taken away. However, there is something odd going on too, something that no one would have guessed. A book of betrayal, love, trust, action and a pure amazing plot line, anyone would be sucked into Tessa’s world. In CA, I was Team Will all the way, I loved his humour and connection with Tessa, however in CP, I’ve swayed unsteadily towards both teams alternatively. Though I found Will and Tessa’s romance not deep of authentic enough, I detected more lust and longing than caring and belonging. As of CP, I am TEAM JEM! I felt that there wasn’t enough of him in CA but now there is so I’m totally happy. Jem is really dear to Tessa and understanding, I really felt like giving him a big hug for his gentleness. Jem is hard to describe, but in a way, he is delicate and gorgeous, all at once. Beautifully and nearly heart breaking. OMG YESYESYES!!! Loved the romantic scene between them, and really made me going ‘NAWW…’ Love never grows old, and should never be given up on. In the end, I feel that Jem is the ideal guy for Tessa, I really thought it was going to be Will, but they are just too much like Clary and Jace. 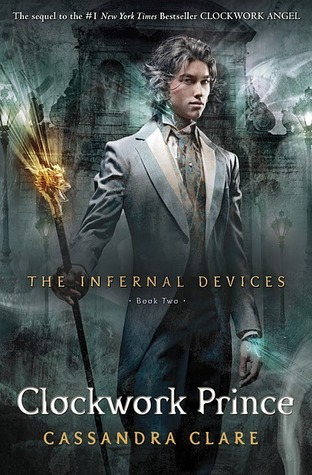 I love Clary and Jace but I want it to be unique in The Infernal Devices. CP is now my favourite book written by Cassie Clare and I am dying to read Clockwork Princess. I recommend this series to Cassie Clare fanatics and people who want to be knocked off their feet.